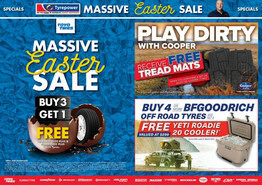 Get The Power Of The Massive Easter Sale. 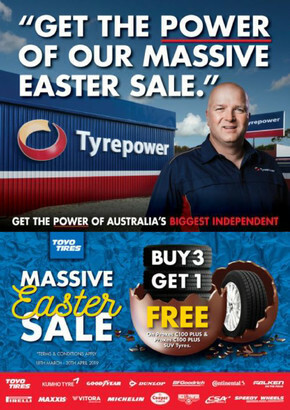 Get The Power Of Massive Easter Sale. Tyrepower is your one-shop-stop for a huge range of tyres, wheels and vehicle services including safety tips and checklists. Tyrepower stocks the most trusted brands in the business, including Good Year, Dunlop, Toyo Tyres, Pirelli, and many more. 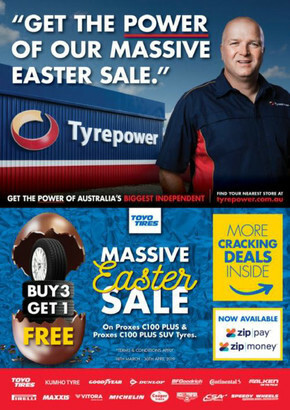 Shop online at Tyrepower to browse the latest catalogues and weekly ads for hot deals and special offers. 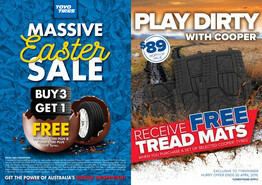 Tyrepower always has a range of terrific promotions running in conjunction with top tyre brands. With previous offers like Buy 3 Dunlop tyres and get 1 free, and Win the cost of your Vitora tyres back: 1 prize to be won in every Tyrepower store, you won’t want to shop anywhere else! Check online to see what promotions are currently running! Shop at Tyrepower and take advantage of their many great services! Some of these services include wheel alignment, suspension, and steering repairs. The experts at Tyrepower can also take a look at your car’s brakes, mufflers, and battery to make sure everything is working at maximum proficiency. Visit the Shopfully website or app for up-to-date information on store locations, opening hours, and to browse the latest flyer!